I've been working very hard on my blog lately, and was starting to feel that I needed to make something for myself, even just a small craft. As Christmas approaches I love making little bits and pieces for extra decorations around the house, so last night I took the evening off and made a little Hama bead Christmas forest with some 3D trees that stand up on their own bases. 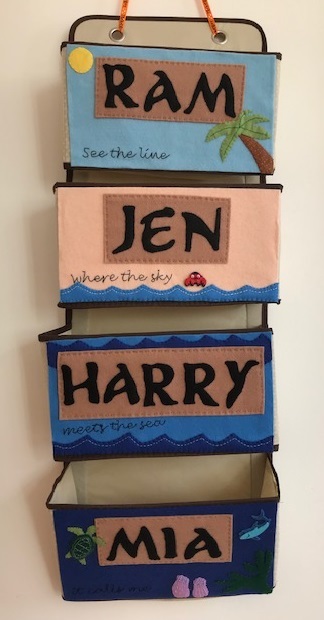 The trees are made on the large square pegboard using some lovely designs that I found online by Karen Benvenuti, sadly no longer available. The tree on the back left is made using some of the stripy Perler beads that I bought on holiday. I think it looks pretty cool! The Perler beads feel a little harder and more brittle somehow than the Hama beads when they are ironed, but they mixed in perfectly with my Hama branded beads and they ironed beautifully. I just need to try and keep the stripy beads away from the children or else they will all be used up and I don't know where I can buy them in this country! I'm thinking about using the trees to create a little Hama bead Christmas display, perhaps making some more little cottages like my 3D Gingerbread House. I can see a little village surrounded by trees snuggled up on the mantlepiece with some fake snow! If you like my Hama bead crafts you can find them all here on my Hama bead crafts page.